January 28, 2018 Robert W.
Speedy sign printing is sometimes necessary when you absolutely have to have that sign or banner fast. For many reasons you have to have a sign fast and in Las Vegas , you can get one. If Las Vegas is a 24 hour town, why can’t you get a sign printed within 24 hours. Many sign companies are offering this service like Posterhead Signs ( www.Posterhead.com ) and others. A telephone book search or internet search ( much easier than the old phone book ) can locate you a sign company that can print that sign in a hurry. In addition to local businesses needing a fast sign, many vendors that come into Las Vegas Nevada for one of the many events / exhibits also need sign printing in a hurry. Often, they forget their signs back home or a change in event details require new signage to be made in a hurry. Websites like www.VegasNow.com or www.VegasMeansBusiness.com list the community events and corporate events that are coming up in the area. Speedy sign printing is completed through the help of large format printers that can print hundreds of square feet of signage an hour. These large printers use eco friendly inks that last a long time in the Vegas sun without fading. The speed of these large sign printing machines has never been more faster and with great quality than ever before. The speed has lowered the cost of making signs and that savings has been passed onto the consumer in the form of lower sign prices. In a world of rising prices, sign have never been cheaper than ever before. Speedy sign printing can be found at the more technologically advanced sign companies in the Las Vegas area. A simple internet Google search will lead you to the right choice. Using www.Yelp.com or Google business reviews will help you also make the right determination . Trade show upright banner stands are very popular at the trade shows, events and exhibits in Las Vegas. Las Vegas is the “King” of entertainment and hosts a 24 hour party atmosphere which attracts many conventions, trade shows and other activities that bring millions of people to Las Vegas. In fact, Las Vegas is the number one destination in the world for trade shows and conventions. Millions of square feet have been built to hold the largest conventions in the world like CES ( Consumer Electronic Show) or Con-Expo. Consequently, many signs and banner stands are required at these events as backdrops and scenery. Sign companies keep very busy making and printing all these signs that are needed in Vegas and a large sign industry has developed accordingly. Sign companies like Posterhead Signs, www.Posterhead.com can make those signs and banners in a single day so that nobody is without their display graphics. Trade Show upright banner stands are very versatile, inexpensive and can be set up in a minute or less. The most popular upright banner stands cost less than $100 and come in many sizes ranging from 24″ wide to about 5ft wide models. These upright banner stands are self contained and come with a carrying bag and stand alone. They take up very little space which makes them a favorite for vendors with limited space in their booths. Trade show upright banner stands can be used over and over again and can also be placed side by side so as to appear to be one large display. Trade show upright banner stands can be purchased locally in Las Vegas at very good pricing. many vendors prefer to have the graphics made here so that their is no risk of damage or shipping mishaps that occur all too frequently. See how one of the local sign shops can help you. January 21, 2018 Robert W.
Las Vegas signs and banners near me is a great search term to find a sign company near you that can make your signs and banners. This is a often searched term for people attending the events at the Las Vegas Convention Center ( www.Lvcva.com ) or the Sands Expo (https://www.venetian.com/meetings/ ) . People attending these events at these locations quite frequently need rush order graphics for the event because there graphics were damaged or simply forgot back home. In cases like these, vendors need to find a sign company near their location to make the graphics quickly and cheaply. Sign shops in Las Vegas are some of the best in the country. With all the conventions and trade shows coming into Las Vegas, sign companies are relied upon to provide inexpensive, quality banners stands and signs for the numerous shows on a regular basis. The convention season ( November thru April) gets quite busy and Las Vegas sign shops are up to the challenge. In other cases, people and businesses from out of state rely upon print brokers to have their signs and banners ready for them when they arrive in Las Vegas. Unfortunately, usually these print brokers have no equipment of their own and rely upon sign companies with the proper equipment to print for them and then the brokers raise the costs of the signs to make a profit. In many cases, the print brokers simply walk away from the job if something goes wrong and leave the businesses without any signage at the last moment. 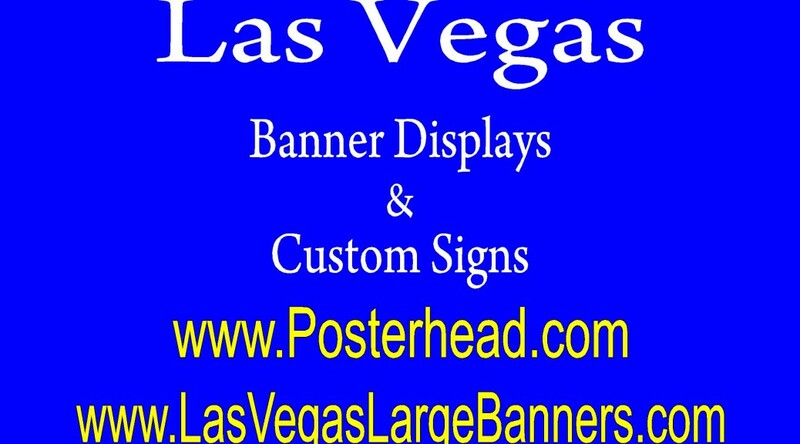 Las Vegas signs and banners near me is a good search term to find a legitimate sign company near your location. By using a sign company near you, you can expedite the making of your sign and this is especially important when you are trapped at your convention location. January 20, 2018 Robert W.
Las Vegas fast 24 hour sign printing can be found in a town that works and parties 24 hours a day. Why should you be limited to standard 9 to 5 for your sign needs when you live or are visiting a town that never sleeps. Las Vegas is the best place to hold your convention / trade show/ event because there is so much to do in Las Vegas and so much fun to be had. While everybody thinks of Las Vegas has the ultimate gambling mecca, Las Vegas has great golf courses, theme parks, outdoor activities and many other types of events. Practically every week, the Artisan Craft Festival ( www.artisancraftfestival.com ) is holding an outdoor activity, farmers market or other family orientated activity. If that is not enough for you, there is gambling, 24 hour shows, top restaurants, top tier hotels and other activities for the adults. Many people come to Las Vegas for the reason of displaying there products at the conventions and require a lot of signage for the events, However, even after months of planning for the shows, sometimes display graphics are forgotten back home or simply need replacing at the last minute. 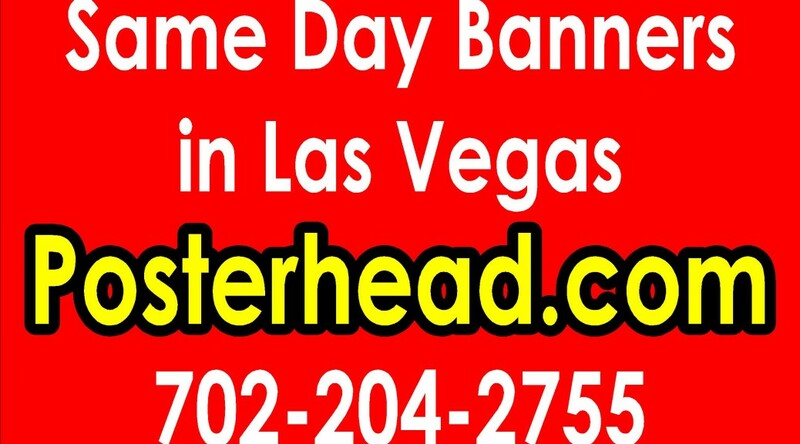 fortunately, there are sign companies in Las Vegas like www.Posterhead.com that can make that vinyl banner, banner stand or sign in a hurry so that you can go on with your event as planned. Thanks to advancements in large format printing, making a sign or banner has never been easier and more affordable than ever before. In a town that never sleeps, you should be able to get a sign made. Contact a reputable Las Vegas sign company to get your banner or sign made same day or within 24 hours a day. There are a multitude of sign shops to choose from to assist you in making your event a success. January 18, 2018 Robert W.
Low cost convention banner stand printing in Las Vegas is available for vendors wanting banner stands for the many trade shows and conventions that are held in Vegas. Banner stands ( retractable or upright banner stands) are a major component for vendors displaying at the shows. These banner stands are extremely popular because they are so inexpensive and easy to set up. They make a wonderful graphic display that is very impressive. Low cost convention banner stand printing is performed by large format printers that print with amazing clarity and detail. The new print heads ( DX-7) are state of the art. The newer printers are also using many more colors to mix and match to get the right colors of your print. While the standard of the industry for inks is the black, magenta, yellow and black, the new large format printers are utilizing those 4 colors plus orange, light blue, light black and light red. By using these additional colors, these large format printers can print deeper colors and better gradients for your designs. The enriched colors make you designs look even better. 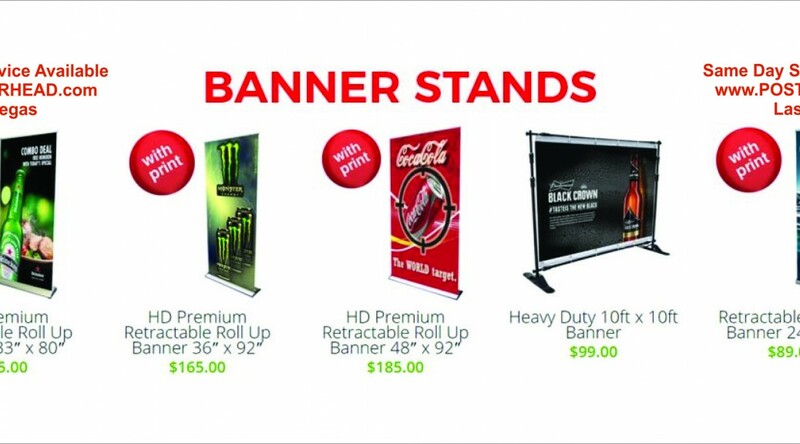 Many banner stands are available in Las Vegas at different prices and sizes. Many of the banner stands start off at less than $100 and can be made the same day. For example, http://posterhead.com/banners/banner-stands/retractable-roll-up-banner-33-x-78/ . This banner stand offers the luxury an adjustable pole so that it can get the perfect height for your banner . Banner stands vary in size and height and can also come with advanced features such as chrome bases. Many vendors choose to have their banner stands made in Las Vegas because it is so easy to pick them up before the show and not risk being lost in shipping or damaged. Contact a banner stand maker today to see how these inexpensive banner stands can help your business. January 16, 2018 Robert W.
Fast vinyl sign printing can get you that vinyl sign in a hurry. Often, for a variety of reasons, people do need a vinyl sign and don’t have time to wait. This is especially true for visitors that are displaying their products at the Las Vegas Convention Center, www.lvcva.com ( 3150 Paradise Road, Las Vegas 89103) or one of the many other convention facilities at the Las Vegas Strip Hotels ( Aria, Flamingo, Cosmopolitan, Caesar’s Palace, Wynn, etc.) Often, these companies that display at the conventions plan for months to have there vendor booths built a certain way and have the graphics shipped in as a package only to find out that something, somewhere went drastically wrong and new vinyl prints need to be made to replace the faulty current ones. believe it or not, this happens all too frequently in Las Vegas and a mad scramble happens to get the new vinyl printed and applied before the show starts. There are companies like www.Posterhead.com that have the necessary printers to get the job completed in a timely manner. Not only does the printing have to be done quickly so that the sign men have time to apply the vinyl prints, the vinyl prints themselves have to be top quality. Fortunately, large format printers have the speed and quality to print very quickly and efficiently so that the job can get done. These new generation of printers use 8 colors instead of the traditional 4 color printers and do a much better job of obtaining quality prints that bring your prints to life. Additionally, the new inks used are environmentally friendly and less expensive than the older inks and are fade resistant. Fast vinyl sign printing can be done very quickly. if you need vinyl printed quickly, check with the local sign companies in Las Vegas to assist you. There are many more reasons why you need rush order sign making and the above list is just some of the reasons you hear at a sign company about why fast signs are needed. But regardless of the reason, Las Vegas sign companies are the best in the business and can get you that sign made in a hurry. Many different types of signs can be made the same day. Signs like banners, banner stands, vinyl signs, sidewalk signs, etc., can be made in a single day, often within hours. More complicated signage takes a few days to make. Large format printers do most of the work. The new, state of the art large format printers can print with amazing quality and speed. The new 8 color printers are doing a better job at mixing different colors to make large prints more realistic than ever before. With the advancement is printing technology, the costs of printing signs and banners has actually decreased and that savings is being passed on to the customer. Trade show and convention vendors love the lower prices and are available to afford more graphics to induce customers to purchase their products and services. Rush order sign making is available for trade shows and conventions in Las Vegas. Most of these companies that can do this rush order signage are located near the convention venues so that the graphics can be made and delivered quickly to your location. Las Vegas late night sign and banner printing can get you out of a jam if you need late night graphics. This is often the case in a 24 hour town where events are always occurring. It seems like most of the events and shows happen during normal business hours, but in truth, more action takes place in the wee hours of the morning and late night when they are setting up the vendor booths for the events. At the Las Vegas Convention Center, www.LVCVA.com , shows are being worked on for many days leading up the event. graphics get damaged or misplaced and need replacing quickly. In cases like these, vendors turn to local sign companies like www.Posterhead.com to print or make those signs and banners quickly. Las Vegas is the leader in trade shows and conventions. More trade shows and conventions are held in Las Vegas than any other place in the United States. To find when and where trade shows are being held at in Vegas, www.VegasMeansBusiness.com is an excellent website to see where and when the shows will be held. Not only will they tell you about the show, they will also let you know the estimated attendance of the show, which helps a lot in planning. Late night printing of signs and services is performed by many sign companies in the Las Vegas area. Competition is high at the trade shows and conventions and each and every vendor wants the best and most updated signs possible. I have even heard of last minute changes in marketing strategy the day before an event that makes a company tear down all their graphics, print new graphics and then replace them all within 24 hours ! Competition for customers is fierce and last minute signs and banners are sometimes required to be number one. January 15, 2018 Robert W.
Las Vegas sign printing services can let you order that banner or sign in Las Vegas for many different reasons. This is especially true for the many exhibits and events that Las Vegas hosts. It seems that many people come to Las Vegas for the wide variety of events that happen in Las Vegas and find themselves in need of last minute banners and signs for the events. Las Vegas hosts many events ( www.Vegasmeansbusiness.com) and there is a great need for last minute banners and signs. Places like www.Posterhead.com allow for 24 hour printing of signs and banners, as well as other sign companies. Las Vegas is a 24 hour town and there is a need for 24 hour print services. Several retractable banner stand models start off at less than $100 and can be used several times and many different events as they come with a carrying case for travel. These vertical banner stands can be full color and include logos and pictures. Other types of signage for print services include sidewalk signs, vinyl signs and of course, vinyl banners. Banners are the easiest and cheapest form of signage and can make a large impression on your audience. These banners are also full color and can be printed very quickly for your use. Printing services can be provided by many print companies in the Las Vegas area. A quick check with Yelp ( www.Yelp.com ) or Google business reviews will help you learn the reputation and skill level of the print company you are thinking about using. January 14, 2018 Robert W.
Las Vegas Construction signs and banners are needed for most construction projects in Las Vegas. The City of Las Vegas, Clark County or one of the other many regulatory agencies require signage at construction sites mandated by laws concerning construction building or dirty moving. Many of the laws pertaining to signage and construction can be found here https://www.lasvegasnevada.gov/portal/faces/home?_afrLoop=578017377471070&_afrWindowMode=0&_afrWindowId=null#%40%3F_afrWindowId%3Dnull%26_afrLoop%3D578017377471070%26_afrWindowMode%3D0%26_adf.ctrl-state%3Dle8jhtcon_29 or Clark County website here http://www.clarkcountynv.gov/building/Pages/default.aspx. Rest assured that some government agency is going to regulate your construction project and want oversight. This is not necessarily a bad thing because we as a society do want construction projects to be top quality and have minimum standards. 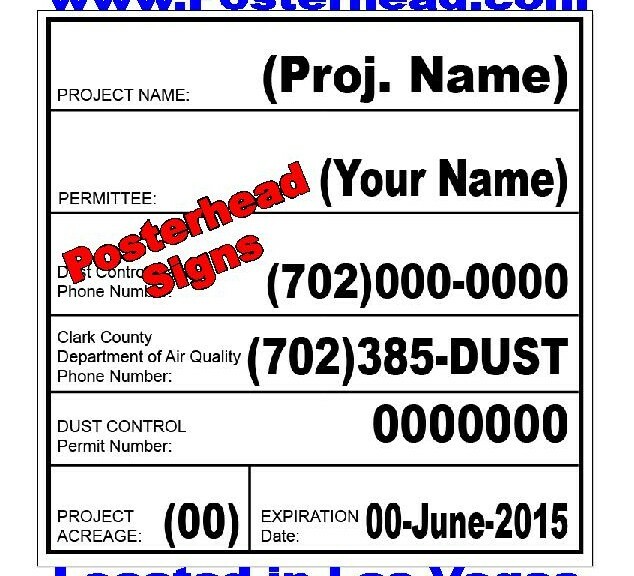 One of the most common signs at construction sites is the dust permit sign required by Clark County. Their website can be found at http://www.clarkcountynv.gov/airquality/compliance/Pages/Compliance_DustForms.aspx. Companies like www.posterhead.com make these dust signs in order to be in compliance with the rules of moving dirt at the construction sites. Dust sign information can be found at http://posterhead.com/dust-control-signs/. Basically, a construction project 10 acres or under requires a dust permit sign of 4ft x 4ft and construction projects over 10 acres require a dust sign of 4ft x 8ft . Both these dust signs require certain information on at he sign as well as certain size and type text as mandated by Clark County. Construction signs and banners are more than just dust signs, they are also warning signs and notification signs that let people know of dangers on the jobsite. They could be hazardous material warning signs, explosives warning signs or simple ” no trespassing” signs required by law or insurance companies to limit liability. Construction signs and banners can be designed and made at local Las Vegas signs shops in many different styles. Certain signage requires .080 aluminum and reflective vinyl, while others can be made out of simple coroplast very cheaply and quickly.